Vendor relationships matter. They matter for keeping costs down, they matter for keeping customer satisfaction levels up. And they certainly matter any time your business has a supply issue that needs resolving sooner rather than later. Very few organizations function effectively without reliable suppliers. So, you should ideally work as hard at building positive connections with the businesses that service your business as you do with your customers and employees. 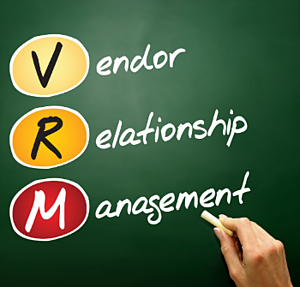 Better Vendor Relations: What’s in it For You? When you engage in best practices for managing vendor relations, you build mutually beneficial partnerships that strengthen your company's performance. Good vendor relations not only help your business run better, they help keep your business running - period. Quality products and services - delivered on time - help minimize customer complaints and returns. Connecting with the right supplier can give your business a competitive edge in terms of pricing, product consistency, or unique service features. Vendors are often an invaluable source of new customers and product or industry news and advice. Prove yourself a valued client, and the resulting cash flow benefits can range from better credit terms, to vendor financing programs. The best supplier relationships are the ones with the potential to drive your business toward greater success: healthier profit margins, improved customer interactions, and better-defined products and services. Choosing the right vendor is the first step in founding a profitable partnership. Analyze your business requirements, then vet prospective suppliers and negotiate any contracts with care. Make sure the service provider you’re considering has the credentials, the experience, and the capacity necessary to support your ongoing needs. At the same time, don’t be a stranger as your partnership evolves. Visit your supplier at their place of business now and then. Ask them to lunch. Invite them to company functions. In many ways, a proven vendor is one of your firm’s greatest growth assets – and your relationship with them is the glue holding that asset in place. It’s worth showing your appreciation by becoming a loyal – and valuable – client. You already know what an ideal customer looks like – now here’s your chance to become one. The goodwill generated by following these simple tips for cementing vendor relations can pay enormous dividends over the long run. It’s okay to be a demanding client sometimes - so long as you’re also a fair-minded one. Vendors appreciate being given adequate lead time to provide their products or services. And while a certain amount of give and take will likely be necessary on both sides from time to time, planning ahead, sharing accurate timelines with your supplier, and taking their needs and methods into account will set both of you up for continued success. Make it an absolute priority to pay your vendors on time. If your business has a particularly costly order or service requirement coming down the pipe, the time to negotiate more flexible terms is before you place the order, not after. And if, despite your best efforts, you do end up running short of cash, be upfront and honest with your supplier about when you’ll be in a position to cover their outstanding invoice. Communication is key for maintaining fruitful vendor relations. Don’t make the mistake of assuming your supply or service partner already understands your business – or worse, that they don’t really need to. Keep them abreast of company news, special promotions, and changes in the personnel they typically deal with. The best way to ward off potential supply problems is with a proactive approach to information exchange. The day may eventually come when you’ll need to replace your supplier or service provider because your company has simply outgrown them. If so, protect your professional reputation – and show your trusted vendor the respect they deserve - by giving them every opportunity to meet your evolving business requirements.